While many of us thought that the State of Jefferson had receded from a high point about two to three years ago, in fact we can see that it is re-invigorated and active. 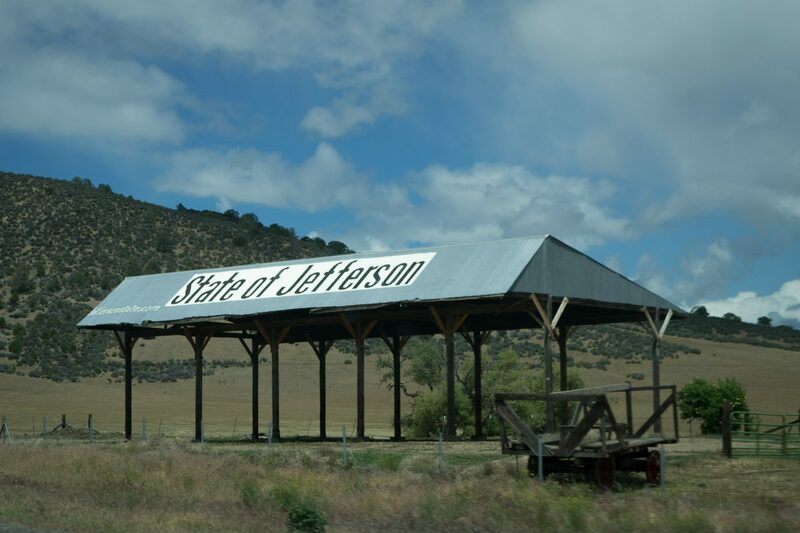 The State of Jefferson and similar groups that wish to separate rural California into a new state are important to be aware of and understand. The point is not whether these groups will be successful in creating a new state; they won’t. The point is that they have successfully branded and exploited a mindset in rural California. They are culture warriors and the SoJ flag represents a state of mind. Candidates that wish to represent CA D1 don’t need to waste their time speaking directly to the group and their representatives, but they should understand the mindset and be prepared to respond to SoJ concerns because they are compelling to a lot of rural folks. The concerns of rural folks are valid; the SoJ solutions are not. We are not Represented. We have 6 out of 80 seats in the Assembly, 3 out of 40 seats in the Senate, and 2 out of the 53 seats in the US House of Representatives. Consequently decisions that impact us, such as the Fire Tax, are decided by people that don’t live here. In fact, they’re made by the urbanized areas of California which have much greater representation in Sacramento. Plan A is to secede and create a new state. Plan B, if unable to secede from California, is to redress the issue of representation by overturning Reynolds v Sims (1964). Before Reynolds it was often the case that urban areas had the same representation as rural areas. It could be the case, for example, that 13 city dwellers’ votes would have the same political force as one rural vote. Reynolds argued that in such cases where representation was not proportional, this was a violation of the Equal Protection Clause of the Constitution and mandated the application of the principle of one person/one vote. A Restoration of a model of representation that disenfranchises people and flies in the face of the one man/one vote principle isn’t morally justifiable. As Chief Justice Warren said, “Legislators represent people, not trees or acres. Legislators are elected by voters, not farms or cities or economic interests.” Yes, the minority must be protected–by settled, Constitutional means. The bottom line here is that any court fight will certainly be long, expensive and will likely fail. District 1 does not have the resources to support such a fight, nor should we–our money is better spent elsewhere. If we are underrepresented the solution is not to separate, it is to lobby and to elect leaders with a strong voice for the district. We are over Regulated. As Californians we have taxes that are either the highest in the nation or close to the highest in the nation–personal income tax, sales tax, gas tax, property tax and business tax. If the State of Jefferson were to become a reality all taxes would be lowered, environmental regulations would be eased, and it is hoped that many jobs will be created in the timber and mining industry. As a result Northern California will be attractive to businesses. There are several problems with these assumptions. The first is that most of the Northern counties receive more money in the form of services, maintenance of roads, education and law enforcement than we pay in taxes. If we separate from Southern California we will find ourselves immediately faced with budget crises, and this is before we consider lowering taxes. We can’t sustain our current levels of infrastructure with tax revenue from our sparse, geographically scattered population, let alone if that tax revenue is radically reduced. Furthermore such an inability to care for our own infrastructure, compounded by the lack of a deep water port and an East/West railroad, does not make for an attractive business environment. Very large swaths of land in Northern California are owned by the federal government and will still be subject to federal regulation whether we like it or not, and there is no basis to believe that these areas will be open to unlimited logging and mining anymore than they are now. It took decades for the legal entanglements of the last state to separate to be sorted out (West Virginia 1863). We haven’t even addressed the assumption of our share of the overall debt of California, which would be substantial and impact our revenue. Stability of the legal and regulatory environment are essential factors in attracting business. Northern California cannot afford to separate and maintain our current quality of life, and separating does not make us an attractive businesses. We must remember that in spite of claims that California is not friendly to business, California is the 7th largest economy in the world. We must remember that a “friendly” business environment cannot be measured with a tax and regulatory yardstick only. A business friendly environment also includes a well maintained infrastructure, good schools, and legal as well as regulatory stability. People must want to live here. We can’t look behind us at unsustainable economic models, we must look forward to creating a network of small business engines throughout our region that support the specific needs of our residents. We must look to the development of new forest products. We must promote specialty manufacturing that uses wood products, especially excess biomass, from our forests. Renewable energy is another area where we can create local jobs that can’t be exported, especially in helping mountain communities with more distributed energy systems that are more resilient to bad weather. We’ve loaded down small businesses with regulations that make it difficult to start businesses and predict the costs for complying with government requirements. We can do better by committing to revisit both laws and regulations regularly, and by building in sunset provisions to programs responding to an immediate need. We need fast, reliable internet throughout our entire region in order to conduct our business and keep pace with the 21st century. We must look forward, not backward. CA D1 must find new and sustainable uses for the resources that we have, there is no turning back to 20th century extractive industries. We need a new rural economy that connects our large and small towns and which facilitates small business and innovation. We need strong Democratic voices to articulate and promote these ideas. We can do all of this while retaining our distinct Northern California values and identity, and we can certainly do it without the State of Jefferson.